Our culture loves to toss the word “karma” around. I see it referenced in newspaper columns, online blogs and conversations at coffee shops. But is it really the solution to anything, as this Internet graphic suggests? From a Christian perspective (that’s my faith), there’s even some Biblical evidence to support it. A section called “Galations” says: What a person plants, he will harvest. The person who plants selfishness, ignoring the needs of others—ignoring God!—harvests a crop of weeds. But the one who plants in response to God, letting God’s Spirit do the growth work in him, harvests a crop of real life, eternal life. 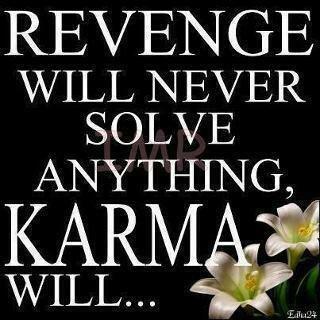 So, will karma solve anything? Not for me. I don’t want to be locked in a prison of cause and effect. And I don’t want karma to take the place of revenge. Serious Christians (and I count myself among them) know and try their best to follow this Bible directive, found in a section called ‘Leviticus’: Forget about the wrong things people do to you. Don’t try to get even. Love your neighbour as yourself. Do we fall short of that directive? Without a doubt. But now you know the ideal we strive for. And you know more about God — the only being truly worthy of judging us for the wrong things we’ve done and the right things we’ve failed to do. If you’re like me, you’ll admit that the ledger of wrong things done and right things not done is pretty long. But there’s a way out — a way that karma will never offer you. That way is a guy named Jesus. Serious Christians believe He is God’s son and God’s gift of love to anyone who is willing to accept that gift. When you accept that gift and declare yourself a follower of Jesus, then you also believe that when He was put to death on a Roman cross, He took on the sins of everyone who calls him saviour. As a result of that, when God looks at a follower of Jesus, all He sees is the perfection Jesus bought for us. We are as pure as Jesus. However, please note: That’s not a free pass to do whatever you like and cynically rely on Jesus to clean up the resulting mess. If you take that gift of love seriously, you’ll want to be with other Jesus followers, building each other up, holding each other accountable and allowing God to do amazing things in your life. Does this sound interesting? Post your thoughts below and let’s have a conversation. http://marthaorlando.blogspot.com/2014/06/forgive-and-forget.html. Hope you’ll check it out!